We spend a lot of time moving stuff these days. It’s what happens when you live in a small place; you are always in your own way. If you want to get some stuff, chances are it’s under or behind some other stuff, so you have to move stuff off the top of stuff to get at the stuff you want. And then you have to move the stuff you took off the stuff you wanted back to where it was or it will be in the way of other stuff that belongs in the place where you put that stuff. 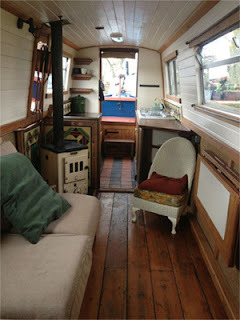 It’s like living on a canal boat, but without the charm. A fourth option would be “move to a bigger place,” but we can’t do that, so we are making use of Options 1 and 2 and striving to avoid Option 3. Having grown up in a three-bedroom house with my parents, two brothers, two sisters, various dogs, cats, guinea pigs, occasionally homeless friends and frequent visitors, I know how to ferret out usable space. Looking up is a good place to start. 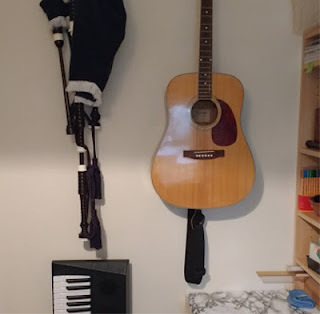 In our tiny office, I have managed to find accessible locations for my guitar, keyboard and bagpipes, something I didn’t even have in the old flat. And, as a bonus, with all that stuff off the floor, you can actually open the office door now. Prior to moving in, we managed to off-load one filing cabinet, leaving us with just two smaller ones. After moving (i.e. once reality set in) it became necessary to dispose of another one. Fortunately, Staples had a marvelous solution in the form of stackable, plastic file boxes. Now, if I need a file, I still have to move stuff, but at least I don’t have to hunt for what I’m looking for; I can see the folders without opening the boxes. This save a lot of time. 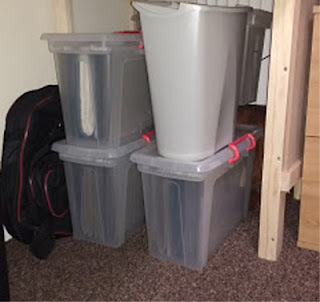 Stackable, transparent file boxes, and a rubbish bin, all neatly stored under other stuff. Another issue was my guitar case. 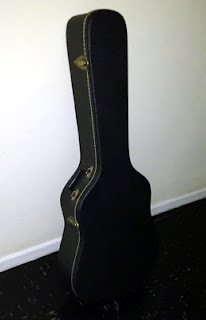 Having solved the storage/access issues vis-à-vis the guitar itself, I now found I had a lumbering, space-consuming, and surprisingly heavy, hard-shell case to contend with. So, I bought a guitar bag, and that solved that problem. However, it left me with another problem: what to do with the hard-shell guitar case. I put it outside in the hall hoping someone would steal it, but unfortunately, we have a better class of tenant here and, several days later, it was still there. So I told my wife I was going to take it into town and leave it in the market place with a sign on it reading, “Looking for a new home,” but she said that would be Fly Tipping. I told my wife that, since I was planning to come back and check on it at a later time, it would not be Fly-Tipping. It would simply be an unattended parcel, which would also mean I would just have to wait for the sirens and the swat team and the helicopters and the loudspeaker announcements that the town center was to be evacuated immediately to know that someone had taken an interest in the guitar case. We’re about as packed in here as we can be now. It’s workable, but, ... well, whenever it starts to get to me, I just remind myself that people are currently paying over a quarter of a million pounds for flats that are smaller (and less well built) than this one, and that do not contain any storage space whatsoever. So, even though we have to move stuff off of stuff to get at stuff, at least we have a place for our stuff.